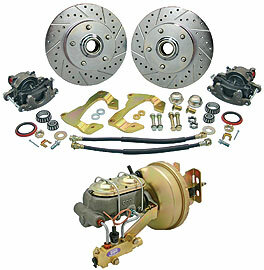 Improve your vehicles stopping power, while retaining stock ride height with our complete stock spindle disc brake kit. Nobody should come up short when it comes to braking performance. Parts #5557CBK-S thru #5964CBK-S8D moves wheels out 7/16" on each side, while parts #6566CBK and #6770CBK-S moves wheels out 15/16" on each side. All kits works with most 15" wheels. Kit includes: disc brake bracket kit, rotors, loaded calipers, bearings, seals, dust caps, spindle nuts, hoses, 7", 8" or 9" booster, master cylinder and pre-bent hard line kit, and proportioning valve. Note: 1967-68 kit will fit 1969-70 models if you use 1965-68 spindles, part #6568SP. Shown with slotted and drilled rotor upgrade.